With total estimated worldwide gross receipts of over $5.6 billion (the highest in history) and total Broadway gross of $845 million (surpassed only by The Lion King), Phantom is the most financially successful entertainment event to date. By 2011 it had been seen by over 130 million people in 145 cities in 27 countries, and continues to play in both London and New York. 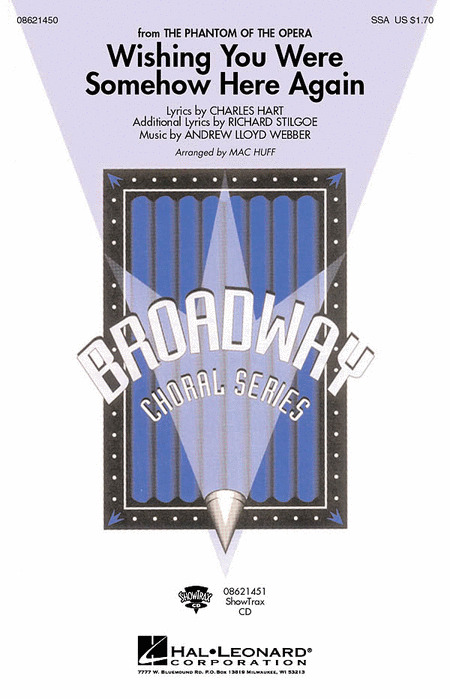 9 songs from the Broadway spectacular, including: All I Ask of You - Angel of Music - Masquerade - The Music of the Night - The Phantom of the Opera - The Point of No Return - Prima Donna - Think of Me - Wishing You Were Somehow Here Again. This souvenir folio features full-color photos from the stunning production as well as piano/vocal arrangements of 9 songs, including: All I Ask of You - Angel of Music - Masquerade - The Music of the Night - The Phantom of the Opera - The Point of No Return - Prima Donna - Think of Me - Wishing You Were Somehow Here Again. 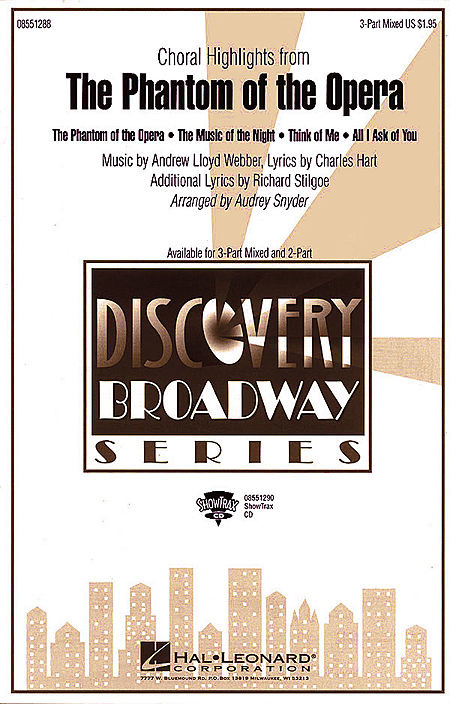 12 selections from the movie adaptation of this Broadway classic: Think of Me - Angel of Music - The Phantom of the Opera - The Music of the Night - Prima Donna - All I Ask of You - Masquerade - The Fairground - Journey to the Cemetery - Wishing You Were Somehow Here Again - The Point of No Return - Learn to Be Lonely. Includes biography and 8 pages of color photos from the film. This medley, from a very unique musical, will especially interest those directors searching for more neo-classical and/or romantic elements in today's show music. Many opportunities for solos and small group sections. Available: SATB, SAB, Instrumental Pak, ShowTrax CD. Performance Time: Approx. 10:45. This ballad from The Phantom of the Opera, as recorded by Barbra Streisand, will create a beautiful and poignant moment in your next concert. Available: SATB, ShowTrax Cassette. Performance Time: Approx. 3:50. Written for the motion picture version of The Phantom of the Opera, this haunting arrangement of the new Andrew Lloyd Webber song is filled with opportunities for musical expression. 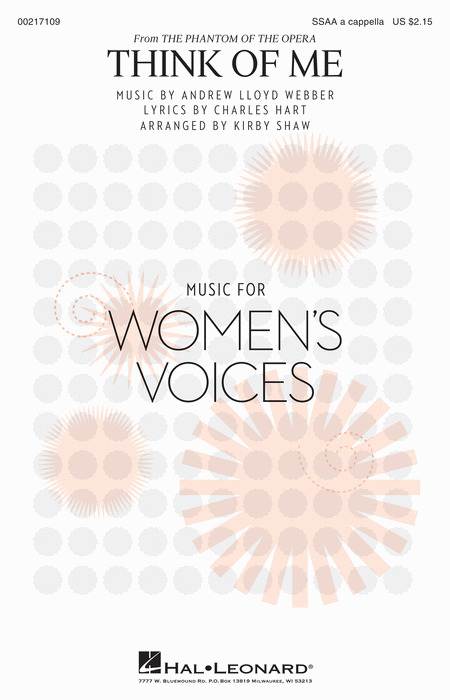 Beautiful in its simplicity, this is not to be missed.Available separately: SATB, SAB and SSA. ShowTRax CD also available. Performance time approx. 2:05. The powerful love ballad from The Phantom of the Opera. In a moderate tempo with lush underscoring, the beauty is in its simplicity! Available separately: SATB, SAB, SSA, ShowTrax CD. Rhythm parts available digitally (syn, gtr, b, dm). Duration: ca. 4:50. All that's missing are your vocals! The music in this book includes the lyrics, vocal lines, and piano accompaniments for eight favorites from this legendary musical classic by Andrew Lloyd Webber. The online audio tracks contain professionally-produced sound-alike audio tracks for performance for 8 songs from the cast recording, including: All I Ask of You - Angel of Music - Masquerade - The Music of the Night - The Phantom of the Opera - The Point of No Return - Think of Me - Wishing You Were Somehow Here Again. The audio is accessed online using the unique code inside each book and can be streamed or downloaded. The audio files include PLAYBACK+, a multi-functional audio player that allows you to slow down audio without changing pitch, set loop points, change keys, and pan left or right. Here are 9 songs from this beloved musical presented in their original keys with piano accompaniments carefully crafted for playability. Titles: All I Ask of You - Angel of Music - Masquerade - The Music of the Night - The Phantom of the Opera - The Point of No Return - Prima Donna - Think of Me - Wishing You Were Somehow Here Again. A terrific choral suite from Andrew Lloyd Webber's The Phantom of the Opera and part of the Novello Voices Choral Suites series. Contains: Think of Me, Wishing You Were Somehow Here Again, The Music of the Night, The Phantom of the Opera and All I Ask of You. These popular modern songs from one of the most famous West End show have been set by Barrie Carson Turner in fabulous arrangements for SATB and piano accompaniment. Andrew Lloyd Webber's beautiful and haunting musical is the sequel to his most famous show The Phantom of the Opera. This powerful love song is full of passion and beautifully explores the hold that love possesses over us. The healing power of love is celebrated. This ballad from The Phantom of the Opera, as recorded by Barbra Streisand, will create a beautiful and poignant moment in your next concert. 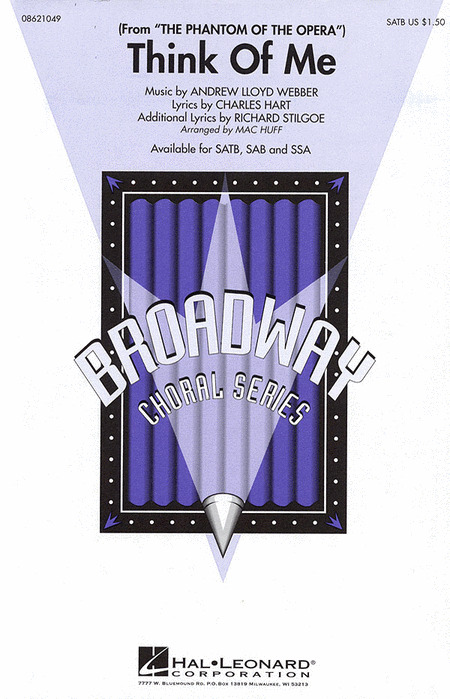 Available: SATB, SAB, ShowTrax CD. Performance Time: Approx. 3:50. Novello Voices Show Singles from The Phantom of the Opera. Arranged by Barrie Carson Turner. Fabulous SATB arrangements of popular modern songs from West End shows and the worlds of jazz and pop music. Written for the motion picture version of The Phantom of the Opera, this haunting arrangement of the new Andrew Lloyd Webber song is filled with opportunities for musical expression. Beautiful in its simplicity, this is not to be missed.Available separately: SATB, SAB, and SSA. ShowTrax CD also available. Performance time approx.2:05. Written for the motion picture version of The Phantom of the Opera, this haunting arrangement of the new Andrew Lloyd Webber song is filled with opportunities for musical expression. 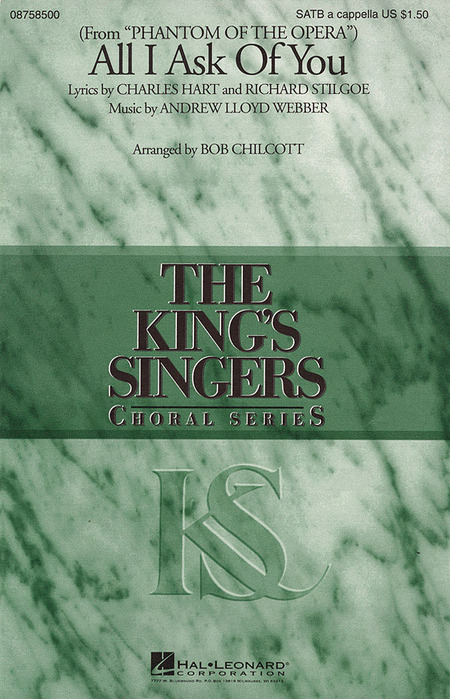 Beautiful in its simplicity, this is not to be missed.Available separately: SATB, SAB, and SSA. ShowTrax CD also available. Performance time approx. 2:05. Andrew Lloyd Webber's beautiful and haunting musical is the sequel to his most famous show The Phantom of the Opera. This powerful Act 2 love song is full of passion and beautifully explores the hold that love possesses over us. The healing power of love is celebrated. The powerful and dramatic song from The Phantom of the Opera in a brilliant a cappella setting! The Phantom Phenomenon sweeps the country as Andrew Lloyd Webber's musical mega-hit captures the imagination of Broadway! The dramatic title song expresses the emotional strength of old-fashioned romance and melodrama. Dynamic! Available: SATB, SAB, Instrumental Pak. Performance Time: Approx. 3:45. 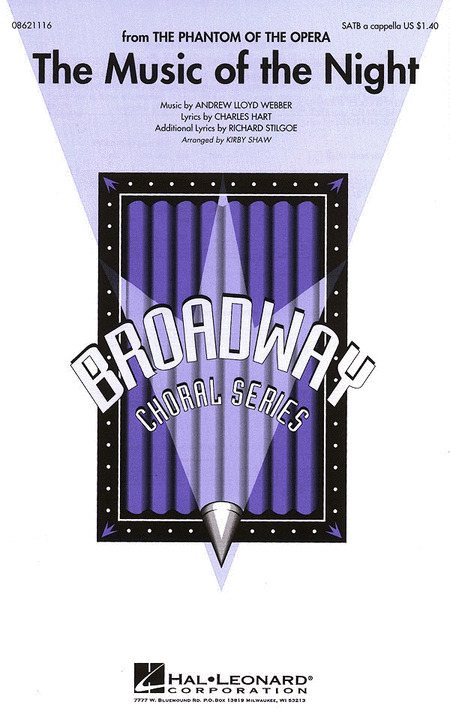 The poignant ballad from the unforgettable Tony Award-winning The Phantom of the Opera is both stirring and compelling in this a cappella choral setting. The poignant ballad from the unforgettable Tony Award-winning The Phantom of the Opera is both stirring and compelling in this choral setting. Available: SATB, SAB, SSA. Performance Time: Approx. 3:45. Beautifully translated into an award-winning film by director Joel Schumacher, The Phantom of the Opera continues to touch hearts. Soaring vocal lines supported by a lyrical accompaniment are sure to touch your audience.Available separately: SSA and ShowTrax CD. Performance Time: Approx. 3:15.